Michael Scharf is Dean of the Law School, Director of the Frederick K. Cox International Law Center, and host of "Talking Foreign Policy," a radio program broadcast on WCPN 90.3 FM (Cleveland's NPR station). In addition, he serves as Managing Director of the Public International Law and Policy Group, a Nobel Peace Prize-nominated NGO. During a sabbatical in 2008, Scharf served as Special Assistant to the Prosecutor of the Cambodia Genocide Tribunal. 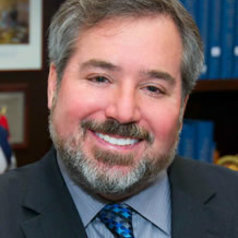 During the elder Bush and Clinton Administrations, Scharf served in the Office of the Legal Adviser of the U.S. Department of State, where he held the positions of Attorney-Adviser for Law Enforcement and Intelligence, Attorney-Adviser for United Nations Affairs, and delegate to the United Nations Human Rights Commission. A graduate of Duke University School of Law (Order of the Coif and High Honors), and judicial clerk to Judge Gerald Bard Tjoflat on the Eleventh Circuit Federal Court of Appeals, Scharf is the author of over 100 scholarly articles and 17 books, including "The International Criminal Tribunal for Rwanda" which was awarded the American Society of International Law's Certificate of Merit for outstanding book in 1999, and "Enemy of the State: The Trial and Execution of Saddam Hussein," which won the International Association of Penal Law's book of the year award for 2009. His last three books have been published by Cambridge University Press. A past recipient of the Case Western Reserve University School of Law Alumni Association's "Distinguished Teacher Award" and Ohio Magazine's "Excellence in Education Award," Scharf continues to teach International Law.